By definition, a true value investor is primarily focused on the weathering the bear market storm and coming out relatively unscathed. In times of market advance, a lot of people get mistaken for investment geniuses when in fact it’s the rising tide that’s moving them up in the world. Bear markets on the other hand, expose the intelligent investor from the fly by night speculator. My approach and the ultimate purpose of value investing is outperforming bear markets. In his 1961 letter to partners, a thirty-one year old investor in Omaha named Warren Buffett told his partners that they should be judging him during times of turmoil and not times of jubilance. Very early on in his career, Buffett was aware that performing well during market turmoil was the key to long-term success as an investor. During the 13 years that Buffett ran his partnership from 1956 to 1969, not only did he destroy the Dow Jones Average during both bull and bear markets, Buffett never had a down year. So while other investors have come along and produced records that better Buffett’s, its Buffett’s preservation of capital that has allowed him to compound money at such a staggering rate. A simple illustration makes my point. Consider two investors starting at the same point in time with the same initial capital. Over a two year period (assumed for simplicity) the investing climate is exposed to both a bear and bull market year. In year one, investor A suffers a 30% loss and investor B suffers a 10%. In year two, investor A enjoys a 50% and investor B enjoys a 30% return. After two years, investor A’s total capital has appreciated 5% and B has about a 17% overall return. Clearly the preservation of capital during the down market enables the enterprising investor to outperform over a satisfactory period of time. If you think about it, what Buffett said is one of the most valuable pieces of advice in investing. The most difficult part is really putting it to use. Back in the 1960’s Buffett bet big on American Express during the company’s involvement in the salad oil scandal. 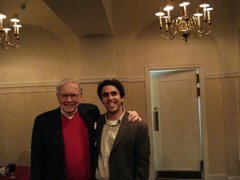 While everyone was running for the exits with fear, Buffett was being greedy and put 30% of his partnerships assets into that one stock. Similarly in 1971, Buffett began buying the Washington Post during a time when everyone fell out of love with media stocks. As the Post continued to decline, Buffett continued buy, investing close to $11 million. That stake is worth over $1 billion today. The current market environment is shaping up to be rife with excellent companies at very attractive valuations. As always, the first goal is approach any potential investment very carefully in order to avoid mistaking a value trap for a bargain. But during these times of turmoil, making significant investments during times of maximum pessimism is one way value investors beat the crowd. And here at Gad Capital, it is what I do each and every day for my partners - patiently waiting for Mr. Market to serve up wonderful businesses at significant discounts to intrinsic value. Market outperformance requires a disciplined and unemotional approach. Going left when the herd is going right is the most difficult process to undertake. It requires an unwavering conviction in your data and reasoning. Thus, in studying the greatest (Buffett, Schloss, Miller, Pabrai), I see six fundamental characteristics that they methodically practice. Each and every day, I put these six principles to work for the Gad Partners Fund. 3. Ability to value a business and assess the quality of management. 4. The discipline to say no. 6. Courage to make a significant investment at the maximum point of pessimism.